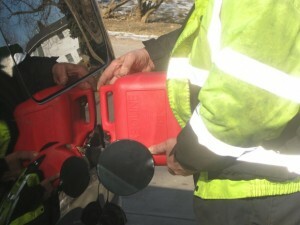 Running out of gas can be dangerous no matter where you are in North Carolina, from the freezing cold in the winter and severe summer storms to the danger of trying to get to a gas station and back. Give us a call 24/7 for emergency fuel delivery, and we’ll get you to the nearest gas station so that you can fill up and be back on the road in no time. Important Tip: If your vehicle is safely on the shoulder, wait in your car with doors locked and seat belts on while waiting for emergency help. Being in your car is much safer than standing on the side of the freeway.